Banana bread is my madeleine – the breakfast sweet that perfumes every phase of my life. As a kid in my mom’s kitchen, cooking for the first time as a young adult, and now as a mother with my own kids – I long for that sweet, cinnamon aroma, the contrasting textures of mushy banana and fine crumb. I bake banana bread regularly in part because my kids love bananas but despise black spots. Once even a little blemish emerges, that poor banana is a prime candidate for either my husband's belly or banana bread. If it's the latter, I peel and pop them into the freezer until I’m ready to bake. The most pleasure I get these days from banana bread is watching my 6 and 3 year old make it together – a rare moment of collaboration that comes from the fact that if they don’t work together, they don’t get to eat it. 1. Preheat the oven to 325° F and grease a 9 by 5-inch loaf pan. 2. In a medium bowl, whisk together the flour, baking soda, salt and 1/2 teaspoon of cinnamon; set aside. 3.In a large bowl, beat the oil and honey with a whisk until combined. Beat in the eggs and then whisk in the mashed bananas, milk, and vanilla. 4. Using a wooden spoon, stir the flour mixture into the wet mixture until just combined (lumps are ok!) If using, fold in chocolate. 5. Pour the batter into your greased loaf pan and sprinkle lightly with cinnamon. Run the tip of a knife across the batter in a swirl pattern. 6. Bake until a toothpick inserted into the center comes out clean, about 1 hour. Let the bread cool in the loaf pan for 10 minutes, then remove from the pan and set on a wire rack to cool for 20 minutes before slicing. Makes 1 loaf. – Adapted from CookieAndKate.com. NOTE: If you have a habit of eating too much at one sitting (as I do,) I suggest slicing the bread and freezing it in batches. Then you can pull out only a few slices at a time. NOTE#2: These make great muffins too, just cook them for about half the time (or until a tooth pick inserted comes up clean.) 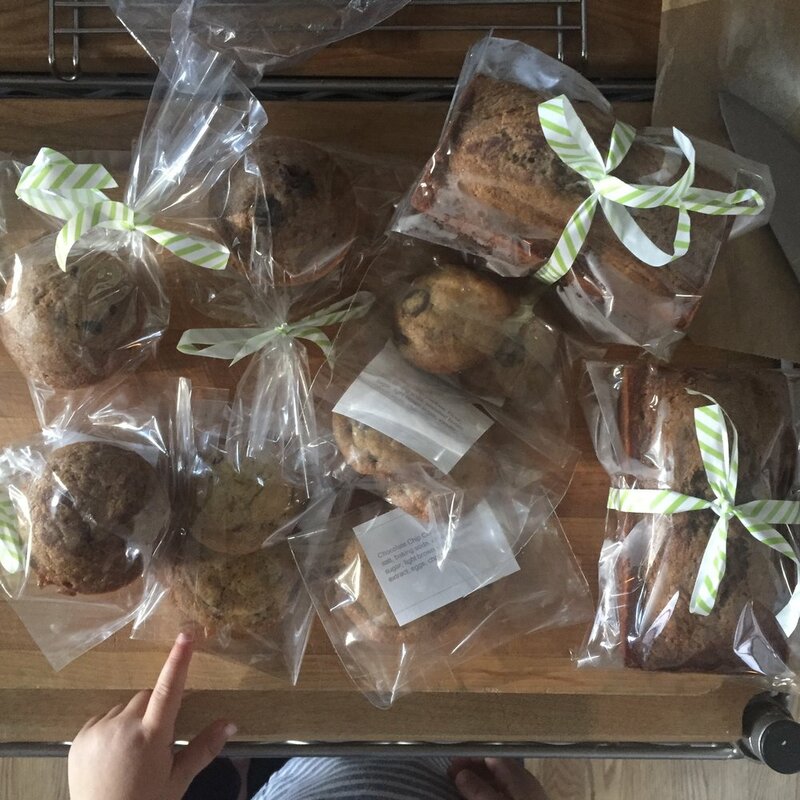 Mini loaves and mini muffins are bake-sale winners.